Cold sores are also known as fever blisters which will get around mouth, lips, neck and chin. These will give you extreme pain and redness with swelling due to unwanted blisters. Cold sores are caused because of infection herpes simplex virus (HSV). These are of two types. HSV 1 and HSV 2 both cause cold sores but mostly many are affected by HSV 1 because when you exchange things and food with affected person then you may suffer with this virus. In most of the cases they may suffer with HSV but they don’t have cold sores. This virus starts affecting slowly until the immune system weakens and it allows the viruses. It may occur when you’re ill, under any stress or suffering by headache, vomiting and fever. In most of the cases they may not have any symptoms also. To get over this many start consuming medicines for long period but they don’t get any permanent solution, also you may get side effects by consuming medicines. So instead of this you can try natural remedies which are more effective and helps to get away from cold sores. It can be cured by naturally made products like apple cider vinegar which will treat cold sores without giving any side effects. Apple cider vinegar is one of best oldest home remedy, for treating different types of infections and wounds as well. ACV helps to cure the wounds and relief from pain and infections because of its anti septic and anti bacterial properties. If you apply ACV on sores it may dry out because the apple cider vinegar can balance the pH levels of the skin. In order to prevent the cold sores from first place before spreading in other place apply apple cider vinegar. 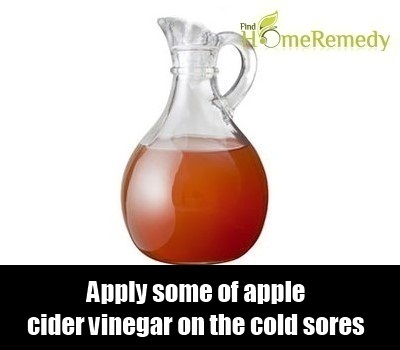 Apple cider vinegar helps you get away from the pain caused by cold sores. Pour some amount of apple cider vinegar in a bowl. Dip a cotton bud in it. Squeeze it to remove excess vinegar from ball and apply it directly on the cold sores affected areas. Leave it for some time and rinse it gently with lukewarm water. Pat the skin dry and continue this application regularly for thrice a day. Or apply a soaked cotton bud or cotton swab in cider vinegar on the sores to secure it with a bandage to leave it for few hours or overnight. Lemon is one of best natural remedies to treat the cold sores, for shorten healing time of cold sores combine apple cider vinegar with lemon juice. Take a tiny container with warm water. Squeeze half lemon in warm water. Add apple cider vinegar in the lemon water. Now soak the cotton bud in the mixture and remove the excess liquid from bud before using it. Apply the cotton bud on the area where cold sores are affected. Leave it for few minutes and rinse it off with lukewarm water. Try to repeat the same process till you get relief from cold sores. Instead of applying topically even you can consume it which gives you more results. As we said before apple cider vinegar has anti bacterial and anti septic properties. So if you consume it by with water it will kill the bacteria that cause infections, Due to infections only sores are caused. Add apple cider vinegar in the glass of warm water. Mix it properly in the glass. Drink it three times a day for infections. Sores are caused because of infections only to get away from this repeat the process regularly. To cure any health, beauty or skin problems try to use always raw, organic, unfiltered and unpasteurised apple cider vinegar which has mother in it. Don’t apply apple cider vinegar if you have dry or sensitive skin, without diluting to prevent over dryness and stinging sensations on the skin. Try to apply a lip balm or moisturiser after applying apple cider vinegar on the affected areas. Make sure to use a clean cotton ball or swab every time when you apply apple cider vinegar on skin to prevent the spread of infection. Avoid applying apple cider vinegar directly to open sores, as it causes stinging or burning sensation. Try to do patch test before using their remedy. However try to use organic apple cider vinegar, it is one of the best home remedy to get away from cold sores. We just hope that you find apple cider vinegar for cold sores is informative. Just give a trial to this apple cider vinegar method to clear your cold sores and feel free to share your experience or queries with us. I’m grateful that you talked about natural treatment for cold sore, I wanted to switch to natural treatments since I wanna avoid taking over the counter medications as much as possible. I never knew that apple cider vinegar has a lot of good components that could help with treating cold sores. It’s impressive to know that apple cider vinegar has an antibacterial, antiseptic and anti-inflammatory property that fight against the virus causing us cold sores and relieves us of pain, inflammation, and irritation. Such a great information about its capabilities like balancing the pH levels of the skin which helps dry out the blisters.